UCO Bank Employees Union (NZ) under the banner of AIBEA welcomes the new UCOites in Punjab, Haryana, Chandigarh and Jammu & Kashmir. Ours union is a majority union here in North Zone. We hope that all comrades joining today in UCO Bank will become the part of UCBEU family and will work unitedly for the upliftment of UCO Bank and our organisation i.e. 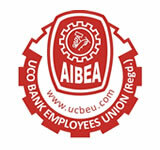 AIBEA. Sir mere pita ji ki 2010 mein death ho Gaye thi, UCO bank mein the.maine usi time nearest bank mein jakar compassionate ground per apply Kiya abhi take job Nahi milee hai. Kya mujhe mratak ashrito mein job mil saktee hai.